It’s Mystery Monday Link-Up time! Part 6 of our Good Fortune Mystery was released on Friday, and here it is Monday and I have seen from so many of you that you were able to kick out this clue over the weekend, if not all in one day. HOORAY for easy clues that fall between major holidays. It does my heart good to know that so many of you were able to squeeze in some machine time. The neutrals you are using in part 6 are so wonderfully varied – each photo was a treat for these old eyes! I do want to stress FIRMLY once again – for those using ONE PIECE OF YARDAGE as their neutral to WAIT before cutting into that fabric for part 6. DO NOT CUT YOUR YARDAGE if you are not string piecing or strip piecing from multiple fabrics. I will not be held responsible if you have cut your fabrics, ignoring what I have said and find that you wish you hadn’t later. This just applies to those using ONE PIECE of neutral as their background. Please folks – if you must cut something, go cut something else – like a UFO project or something. If I suggest “WAIT IT OUT!” That means WAIT. IT. OUT. Check out these shares from our Quiltville’s Open Studio group on Facebook! Quipped by Bonnie K. Hunter at 8:53 AM 14 Snips & Comments by others! Just pick up a brush and dig in! I love – I mean deeply, absolutely, positively ADORE the old quirky door frames and the variety of mismatched doors of various sizes – none of them the same – at Quiltville Inn. Some of them have been repaired with added bits and pieces holding them together – the door knobs also varying throughout the house. A hodge-podge of 135 years of living under this roof. And while “shabby chic” and “chippy” are the in-thing with farmhouse style decorating, I’m just not one to faux-shabby anything. I like to think of what the original owners may have preferred to see in this grand old house. Given the choice – would they want chipped up paint with sanded and roughed up corners to make it look “vintage?” Heck, no! And since most door frames, doors, moldings and base boards are going to take at least two coats if not three, just pick up a brush and get busy with it. Make the rounds. Then come back again in a day or so and do it again. Quipped by Bonnie K. Hunter at 9:00 AM 36 Snips & Comments by others! There are days when all you wish for is time to sew. I have counted on the holidays to bring me that “down time” that I need – but there has been LITTLE machine time over the past week. Still, I was able to crank out some more purple triangles where I was running low for a current project. Pieced one evening, and then pressed the next. It’s amazing what you really can do with an hour here, an hour there making you realize you CAN accomplish quite a bit in small bites of time. Not that I’m getting cranky or anything – There are other things that I have longed to have time to do – and to be able to do them as a family has been a great experience to date. It’s become our daily ritual – wake up, watch the sunrise, have breakfast. head down to the cabin studio to sit at my computer and type out that morning’s blog post, or write a mystery clue, or work on class supply lists for the coming year, or answer emails of a variety of natures – and by 9:30am I’ve been in the van, Sadie in tow – heading 7 miles up the road to Quiltville Inn to continue on with the next item on the renovation list. Quipped by Bonnie K. Hunter at 8:55 AM 52 Snips & Comments by others! These have sat untouched since Christmas. But I’ll get to them eventually! I am surrounding the recycled shirt nine-patches with purple bonus triangles to go in along with the red ones. This is going to be fun – when I can get time to get back to it! For now, sewing is on the back burner as we work on doing some of the much needed fixes at Quiltville Inn. Coat 3 has been brushed on to the kitchen cabinets – FINALLY looking the way they should. There has to be a life lesson in that – take it slow, there is no rushing. It can’t be done all at once, but in smaller bites. Bit by bit things will even out. The bathroom cabinets have received coat 2 – and I ran out of paint, so another trip to Lowes was made last evening. I think we are getting to be on a first name basis with these folks – all roads lead to Lowes! Quipped by Bonnie K. Hunter at 9:08 AM 26 Snips & Comments by others! No, the winner isn’t Sadie, but she steals the show wherever she goes and wanted to photo-bomb the post so how could I say no?? This morning we are drawing for the winners of the December Quilty Box and Quilty Box Mini! Did you get your entry in? Quipped by Bonnie K. Hunter at 9:38 AM 37 Snips & Comments by others! It is indeed and beautiful Christmas Morning at the cabin! This is a very short post, as our goal today as a family is to spend time together in the same room, not apart in our own corners of the cabin each attached to our own mobile devices and computers. There are favorite old movies to watch. There is a pumpkin pie baking in the oven for tonight’s dessert – filling the cabin with spicy hints of cinnamon and nutmeg, and Christmas music is playing through the sound bar via my favorite holiday channel – James Taylor Holiday. A family funny – did you catch that the presents are wrapped using electrical tape to hold the paper on? When you live this remotely, it isn’t possible to always just go buy scotch tape. This was The Hubster’s doing. Whatever could be found on his work bench was what had to be good enough. Quipped by Bonnie K. Hunter at 9:25 AM 39 Snips & Comments by others! Things have finally settled down here at Quiltville – spending time at our cabin in the mountains of Southwestern Virginia just fills me to the brim and rounds out all of my rough edges and mis-matched points don’t seem to matter as much. LOL. Wherever you are, and however you are spending the holidays, may your corner of the world be lit by a little more hope, a little more joy, a little more patience and love for those we share this beautiful planet with. You have enriched my life beyond measure – and I am so grateful for this time of year and our mystery quilt adventures that bring us closer together as we work to bring these clues to a fine and wonderful finish. Soon, my friends – so very soon! Quipped by Bonnie K. Hunter at 8:36 AM 15 Snips & Comments by others! Balm to my soul, this is my bliss! I arrived in Virginia yesterday afternoon, the van full to overflowing with groceries, quilt projects, items for Quiltville Inn – my clothes for a week, my backpack with my laptop and busy bag – It’s full on Christmas mode time. There is a definitely “elevation line” as I climb up and over the mountains on highway 16 leading north out of Wilkesboro, North Carolina. the road rises steadily through Miller’s Creek, through Wilbur (also nicknamed “the flats” by us) - and up toward the Blue Ridge Parkway before finally reaching Jefferson, NC and onward to the Virginia state line. The roads were clear with no snow until just before the parkway – By the time you have gone under the parkway overpass, temps have dropped 10 degrees from the high 40s to into the 30s and snow is still visible along the sides of the road, in yards, fields, farms, and definitely on the mountains in the distance – the remains of 20’’ of snowfall a couple of weeks ago. Quipped by Bonnie K. Hunter at 9:12 AM 25 Snips & Comments by others! This little ditty happened last night. Isn’t that always the way that it gets you? The ideas? Quipped by Bonnie K. Hunter at 9:30 AM 46 Snips & Comments by others! And SOMEONE is going to win this delicious December Quilty Box featuring Quantum fabrics by Giuseppe Ribaudo, AKA Giucy Giuce! I am so excited about this fabric – rich tone on tone geometrics which are an absolute favorite for me. I follow Giucy on Instagram and he is quite the character and always keeps me entertained with his travels, and especially his video stories. I feel like I am right there in the middle of his life and he is talking to me – I never know what he is going to come up with next! Quipped by Bonnie K. Hunter at 9:04 AM 41 Snips & Comments by others! Some red and white piecing has been going on! Well, maybe the tan ones are dirty snow? LOL! All of our snow is gone after this weekend's round of heavy rain, and a few days of temps in the 50s. I hope that is the last I see of that white stuff for a while. My favorite size of half-square triangle just happens to be the Bonus Unit size –measuring 2’’ and finishing at 1 1/2’’. It’s the PERFECT size for loads of triangle punch. They are not too big, not too small, and easily made with 2’’ strips from the Scrap User’s System so it is easy to pull in loads of variety – the more the merrier! I had stitched these on a previous round of night time sewing, but they’ve sat for a while as my evenings have been hijacked of late. My promise to myself of studio time meant that I could move on to my next step – simply sew these to neutral 2’’ squares. I have a plan – but it’s a slow growing one. Still – any step forward, no matter how slow is still measurable progress, right? Quipped by Bonnie K. Hunter at 8:33 AM 30 Snips & Comments by others! This quilt dates back to …well, quite a while ago. It was from my love of blended quilts phase. Florals and busy backgrounds with some stripes, plaids and other parts pieced together strippy fashion for ME as the only female in a house full of men-folk. This was long before quilt patterns and book writing and magazine columns and world wide travel for teaching and lecturing. Times were so much simpler then. Though, as I really examine what was going on in my life during the making of this quilt I am brought back to the time when both of my boys (one in middle school and the other in high school) were both suspended on the SAME DAY from two different schools for two different offenses and I didn’t think I could survive being a parent either! Quipped by Bonnie K. Hunter at 9:08 AM 174 Snips & Comments by others! It’s another Mystery Monday, can you believe it? It seems the time between each PART release on Friday and our Link-Ups on Monday are getting closer and closer together – just where does the in between time go? I hope everyone had a wonderful weekend and found some time in between the holiday hubbub for some baking, some visiting, for some reflecting on Christmases past, and was able to squeeze even just a little bit of sewing time in! My favorite part of the weekend was popping in at odd moments to check out our #quiltvillemystery and #goodfortunequilt tags on Instagram, as well as thumbing through the feed in my Quiltville’s Open Studio group on Facebook and see what YOU were doing! The excitement is building with how all of this is going to fit together, and it brings me so much joy. We gave you FIVE options on how to do Part 4. Which one did you choose? Quipped by Bonnie K. Hunter at 9:11 AM 40 Snips & Comments by others! These are Mona’s Part 4 units for Good Fortune! I am just so tickled that she is sewing along with us this year – and just as excited to be waiting for FRIDAY to arrive, printing clues, digging into fabrics and having a blast. She’s been leary before – afraid to be overwhelmed, and finished her On Ringo Lake after the reveal because she wasn’t sure she could keep up. But this year? No Holds Barred, Baby! If you were to come look at my stash, you would see that I have LESS Orange than anything else. Quipped by Bonnie K. Hunter at 2:12 PM 87 Snips & Comments by others! It was a wonderful quiet evening of hand quilting on Jason’s hexie quilt – the main red/green Christmas decor hanging out in my living room right now! Stitching happened to Mowgli on Netflix followed by a round of Blue Bloods accompanied by popcorn on the stove – there is NOT a packet of microwave popcorn to be found in this house. Once you’ve made real popcorn, there is no going back. Quipped by Bonnie K. Hunter at 8:42 AM 50 Snips & Comments by others! It was dropped ON THE DOORSTEP last night by the USPS. See that stamp in the corner? This is when I was using up the last of my Net-Stamps for first class postage a year ago. Evidently – Yours Truly, in a mail-order-induced-zombie-state-of-automation, stuck a US stamp on a package needing to arrive in South Africa which evidently wouldn't, couldn't and didn’t get there with first class domestic postage. Well, DUH! Hanlie Van Zyl, if you are reading this – do you remember this lost shipment? We thought her package was gone-forever-never-to-be-found and I sent a second one – and it turns out that this one never left the good ole USA. Quipped by Bonnie K. Hunter at 9:11 AM 31 Snips & Comments by others! Mona doesn’t have odd angles – but her runner does! This is the valentine runner that Mona quilted a few weeks ago. She had no idea when she was designing this that it was going to require a tiny bit of an adjustment when applying binding since the corners were roughly 60 degree instead of 45 degree. And since I was teaching HER how to do it, I thought this might be a good way to share a couple of hints with you just in case you want to bind something with odd corners. Quipped by Bonnie K. Hunter at 9:46 AM 26 Snips & Comments by others! Silly Out and About Lunch Selfie! Celebrating with Rick and Mona! And I am wearing the lampshade on my head! LOL! These are the faces of three very happy friends who met up for a round of antique mall wandering and lunch out to celebrate the closing of the North Carolina cabin ---happily in the hands of new owners who will love it as much as we did. In fact, I’m wondering if they were up there for the snowpocalypse that befell this corner of North Carolina, Virginia and beyond and how they fared. Quipped by Bonnie K. Hunter at 9:14 AM 24 Snips & Comments by others! Hello, Monday! How are ya?? There is a whole lot of showing and sharing of completed part 3 units for our on-going Good Fortune Mystery happening all over social media, and I couldn’t be more thrilled! 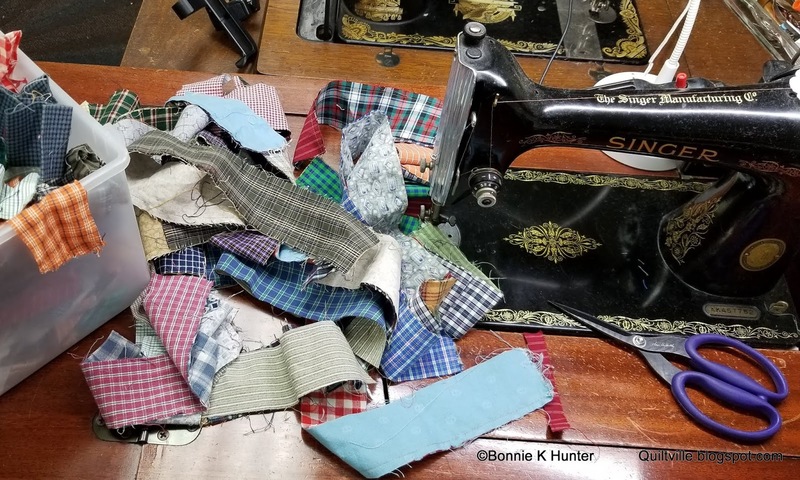 If you follow along with our hashtags #quiltvillemystery and #goodfortune quilt on Instagram, you are going to see a wondrous array of colors and fabrics -- it gets the juices flowing! I can’t say enough about how much I love this time of year and how quilters are running with it! Quipped by Bonnie K. Hunter at 8:49 AM 15 Snips & Comments by others! A big snow dumping this early in December is not a usual occurrence in North Carolina. Sometimes we get a light dusting in January, or perhaps some freezing rain (that always takes the power out) in February – but this is a solid several inches, and it is still coming down. Quipped by Bonnie K. Hunter at 10:02 AM 70 Snips & Comments by others! How did I end up here? Well let me tell you, it wasn’t intended! Not exactly. We finally sold the North Carolina Cabin (1 1/2 years after moving out!) and our closing was yesterday morning in Jefferson, North Carolina. Mona and I finished up as many book orders as we could and headed out at 3pm on Thursday afternoon – she to her home in Boomer, and me – planning on spending the night at the Virginia cabin, so I would only be a short 30 minute drive from Jefferson for the closing, instead of fighting Friday morning traffic through Winston Salem, and have a 2 hour morning drive on a morning that also needed Part 3 of Good Fortune released, and another 500 copies of String Frenzy as wave 4 entered the Quiltville Store. No, that would be too much to do in one morning and expect to be in Jefferson by 10am, not to mention that I’d sign for the closing and turn right around and drive another 2 hours home? There had to be a better way. Well, the way I ended up was not the way I intended! Quipped by Bonnie K. Hunter at 9:42 AM 21 Snips & Comments by others! Quipped by Bonnie K. Hunter at 9:07 AM 31 Snips & Comments by others! I have a small house. It is overrun by boxes at the moment! This is a shot from the little front room toward the dining room where “Quiltville Mail Order Central” is happening – oh, my goodness is it ever happening! And it isn’t just from within these walls. I’ve got my postal person bringing me more tubs as they pick up more outgoing mail from my doorstep – she is intrigued and amazed that we are doing all of this from wihin a seemingly unremarkable little 1970s bungalow. Remember the movie "Ground Hog Day" where the main character wakes up to find he is in the same day again? Yep! That's pretty much it over here! LOL! Quipped by Bonnie K. Hunter at 9:32 AM 24 Snips & Comments by others! Quipped by Bonnie K. Hunter at 8:15 AM 18 Snips & Comments by others! Quipped by Bonnie K. Hunter at 8:09 AM 21 Snips & Comments by others! I’ve made a rule for myself. I don’t care what is left in the queue to get out – by 8pm I am DONE. Let’s face it, no one is any good after staring at a screen for more than 13 hours. Mistakes happen, and I’d rather make mistakes of the kind I can pick out with a bit of seam ripper action, not postal problems by signing a book to the wrong person, and mailing it to someone else, or shipping the wrong book or item – oh boy! So 8pm to bedtime belongs to me! Sometimes you have to leave the mail order, and hit a quilt shop! Here I am with the staff of Studio Stitch in Greensboro, NC – a short 1/2 hour drive from me, but in a side of town that I rarely wander to because Winston Salem is closer to home. It took months and months of planning to find a time when Elizabeth (on the far left) was at the shop, and I was in town with free time to head over to pick up something that she had been saving for me for months – read on to see! It’s been a while since my feet have wandered through a quilt shop door – I’m thinking of the day I had in Nebraska and wandered around with Stacey in her big ole pick up truck. Quipped by Bonnie K. Hunter at 9:52 AM 21 Snips & Comments by others! 2003 – 2018. About time! I rediscovered this quilt top while pulling fabrics to help Mona assemble a back while she was here a couple of weeks ago. Was it only a couple of weeks? It seems like last month at least! I so enjoyed the three days that she was here – we quilted up SIX of her projects! Two large quilts and 4 small projects were then trimmed and made ready for binding so she could do that part at home. And because I was SO in the mood to continue hearing the hum of the machine, I pulled this one out. I always knew it would be great for the queen bed at the cabin SOME DAY – but with so many of my own quilts around, and fearing this one needed “Custom” quilting (that I didn’t have the time or desire to do with deadlines toward my own designs looming..) it had sat. And sat. And sat. Quipped by Bonnie K. Hunter at 8:36 AM 31 Snips & Comments by others! Hurry Hurry! November is almost over! I returned home last evening to find my November Quilty Box sitting on the table beckoning me to OPEN, OPEN, OPEN! Oh my goodness!! It’s got Tula Pink, a fun Clam Up zipper tote pattern, the beautiful zipper included that perfectly matches the fabric in this bundle! Even the liner fabric is included – and I’m sure this will be enough to make MULTIPLE bags as gifts for family and friends. Whoowhoooo! And since November is ticking quickly away – we better get on this! Quipped by Bonnie K. Hunter at 9:06 AM 20 Snips & Comments by others! Things have turned incredibly cold! I don’t know about you – but anything below 40-something is just NOT something I enjoy getting out into. Best tolerated from the inside with some hand quilting in my lap and a fire in the stove. Quipped by Bonnie K. Hunter at 9:21 AM 17 Snips & Comments by others! Good Cyber Monday Morning, my friends! This post comes with a warning – it’s going to be a long one as we’ve got a lot going on today. Grab a cup of your favorite and pull up a seat! First things first – I have put another 500 PRE-ORDER copies of String Frenzy in the Quiltville Store. Books are on the truck – they should be delivered this week and I will get in to filling orders in the orders that they were received as quickly as possible. Orders from today's 500 will be filled and posted as wave TWO – and it is likely 10 days to 2 weeks before that order filling will happen. Please remember you are placing a PRE-ORDER! Orders are filled in the order that they came in and it could be that there are several hundred orders in front of yours being filled by yours truly. (With some help from some friends and family!) I will do everything I can to get orders out as quickly as possible. Quipped by Bonnie K. Hunter at 8:31 AM 19 Snips & Comments by others! Happy Last Sunday of November! I feel like we are doing this String Frenzy Trunk Show thing a little bit inside-out, but it was too much to post along with Friday’s mystery post – and Thanksgiving was in the mix, and let’s face it – the books are still on a truck and haven’t arrived here yet! So once again I am flying by the seat of my britches and shoveling this in on Sunday, so we can do our first Mystery Monday Link-Up for our Good Fortune Mystery tomorrow! I’ve loved writing this book. I’ve loved even more – making the quilts for this book, and I know this isn’t the end of my own love affair with string quilts. String quilts are just the most fun I have ever had in my quilting life, and there is no stopping this string piecing train. To get the detail photos for this post, I had to go back to my google photo albums, back to September of 2017 when I was getting the quilts ready to send off to photography for my Quilter's Date Keeper. This book writing thing takes a LONG TIME! And so my friend - this is what you are going to find within the pages of String Frenzy. Quipped by Bonnie K. Hunter at 9:36 AM 47 Snips & Comments by others! Rick, Mona, son Jeff, Dave, Me and Dad! And yes – we were out in shirt sleeves – it was 50-something outside and sunny. Last night as I went to bed there was ice falling from the sky – what a difference a couple of days makes. it has now warned UP to 35. Oh boy! Quipped by Bonnie K. Hunter at 8:24 AM 20 Snips & Comments by others! Found in West Jefferson, NC. I took my dad on a little jaunt to Jefferson/West Jefferson North Carolina yesterday afternoon – there were a few odds and ends to pick up, and then we met with the rest of the family who were inbound from Winston Salem – deciding to have dinner at our favorite Mexican Place in Jefferson. Only upon arrival we saw that they were CLOSED. No worries – in the same plaza is The Winner’s Circle – and you can find just about everything you could ever wish for on their menu with portions so large you could feed a family of 4 on one platter. No lie. Half of it came home! But before we ate – there was some time to kill. We hit up an antique mall I love to frequent to just to see what holiday decorations may be out (not many) and with Dad in tow, I told him to just look around for anything that interested him. “It’s like a museum where you can touch stuff!” I announced as he headed over toward a display of vintage cameras, from old brownies to polaroids, and we talked about the technology of this long out of date artifacts, the earlier versions of what is now found on our cell phones and live in our back pockets on a daily basis. Can you imagine? Some of them even had manuals still in their boxes – so much fun to look through. Quipped by Bonnie K. Hunter at 8:05 AM 28 Snips & Comments by others! Dad and I went out and about yesterday. It was really too cold for any “real” hiking – and Grayson Highlands State Park was full of hunters for a controlled hunt so not a good time for us to be on trails, anyway. But we did what we set out to do – what was on our agenda to do, and what I was so happy to do! I showed my dad around the area and I think he gets it why Southwestern Virginia has just captured my heart and won’t let go. “This is sure a world away from where you grew up!” he said, memories of growing up in the busy and bustling bay area of California. Life in San Jose in the 60s, 70s, and 80s definitely WAS a world away. I never would have thought life would send me here, either! To my young self – a life in the Blue Ridge Mountains of Appalachia was just not even on the radar. Yet here I am. Quipped by Bonnie K. Hunter at 7:25 AM 36 Snips & Comments by others! Good morning from Quilt villa, VA! Yes, the Monday before a major “meal” holiday – Thanksgiving. I knew it would be a zoo – but I had company all weekend, and there was no room in the fridge at home to buy all of this a week or more ahead and then have to transfer it up here to the mountains. I wanted items, especially produce to be somewhat fresh – and I’d be picking my Dad up at the airport anyway, so how simple it would be to just make a couple of early afternoon stops before swinging by the airport to pick him up? A master of time management and organization, I thought I had this nailed! And then…..
Quipped by Bonnie K. Hunter at 9:10 AM 41 Snips & Comments by others! I love my piecing machines VINTAGE! But I want my longarm DIGITIZED! I think we’ve done in my computer system. I got all the way to the last border and the machine started going herky-jerky. No longer were my feathers nice and round, but they looked like a 3 year old drew them on an etch-a-sketch. AUUGHH! Son Jeff and The Hubster came down to see about adjusting cables further (Though he still can’t see anything due to Thursday’s Lasik and the protective lenses that are still in place on his eyeballs.) and things ran BEAUTIFULLY for the rest of that one row…but when I advanced the quilt to the last row, the fill in at the edge of the border – Herky Jerky All Over Again. I unplugged myself from the cables and finished up the edge of the quilt free-hand, going old school. Boy, it has been a LONG TIME since I have done that, and moving that machine head is a skill that can be lost over time. Quipped by Bonnie K. Hunter at 10:17 AM 23 Snips & Comments by others! It was a Bad Hair Saturday. But it was a good quilting day! Mona and I pushed it to the max as we quilted SIX projects – SIX! And by the time she left, I had pulled out a seventh – something that had been hanging around since 2004. We were on a roll, and there was no time like the present to do it, and no reason to stop this quilting train. Quipped by Bonnie K. Hunter at 10:11 AM 23 Snips & Comments by others! I’ve had a blast with my friend Mona here. She’s getting to be a pro at using my computerized longarm quilting machine. My big fear is that she will find she has to have her own and she won’t come spend the night with me anymore on a joint quilt-fest! Quipped by Bonnie K. Hunter at 9:52 AM 20 Snips & Comments by others! It’s a Friday FriYay Gift-Away day! And have I ever got some goodies for not just one but TWO lucky winners! You know that I’ve been sewing with Signature 60 wt 3-ply thread and loving it. A&E threads out of Mt Holly, NC have been manufacturing fine thread for the sewing industry for more than 100 years. Before sewing with the 60 wt for my hand and machine piecing, I have been using (and still do!) Signature 40 wt on my long arm machine for years. Quipped by Bonnie K. Hunter at 9:47 AM 48 Snips & Comments by others! Quipped by Bonnie K. Hunter at 8:00 AM 16 Snips & Comments by others! Quipped by Bonnie K. Hunter at 8:59 AM 22 Snips & Comments by others! Quipped by Bonnie K. Hunter at 9:39 AM 7 Snips & Comments by others! Mary Margaret Malcolmson Wilkinson Buckbee. While yesterday, November 11th, 2018 was the traditional day for Veterans Day, Veterans Day is observed as a state and federal holiday in 2018 TODAY Monday, Nov. 12th this year. A federal holiday means that local, county, state and federal offices and agencies are closed. Which includes the Post Office – but not Quiltville! Yesterday was a busy travel day for me, on the way to the Indianapolis airport by 7am, making my connection in Atlanta and home by early afternoon. It didn’t give me much chance to write a veteran’s memorial post the way I wanted to, so like the federal agencies mentioned above, I’m observing TODAY and keeping these folks in my thoughts. While not a typical veteran herself, my grandmother was raising small children while her husband, my grandfather was in the US Navy. This picture was taken in 1943 when grandpa was serving as a Naval Officer in the South Pacific. She occasionally earned money working as a photographer’s model. Quipped by Bonnie K. Hunter at 9:30 AM 37 Snips & Comments by others! All of these things were going on yesterday! Midnight Flight from MORE Adventures with Leaders & Enders was the workshop yesterday – the last of my 2018 tour year – and energy levels were SO high. You know, we went back in time to check out just WHEN these dates were planned – the letter I received (hand written invitation at that time!) was dated 2013. We really DID wait 5 years for this date to arrive. And that sometimes happens when a guild only meets the second Thursday of the month, and there are only so many second Thursdays to go around within any given year. FIVE YEARS! And yet it flew by so very quickly. Quipped by Bonnie K. Hunter at 6:45 AM 9 Snips & Comments by others! 49 quilters running thread through fabric – piecing up the pieces, making blocks - but even one better, MAKING FRIENDS! I’m having a great time in Carmel, near Indianapolis – and the time is flying just as fast as the scraps are. Yesterday’s workshop? Scrap Crystals from my book MORE Adventures with leaders & Enders – And oh, the colors that came out to play! Quipped by Bonnie K. Hunter at 8:09 AM 15 Snips & Comments by others! Quipped by Bonnie K. Hunter at 7:41 AM 11 Snips & Comments by others! Quipped by Bonnie K. Hunter at 7:19 AM 55 Snips & Comments by others! Quipped by Bonnie K. Hunter at 9:24 AM 26 Snips & Comments by others!